SOME THOUGHTS: From my perspective, this passage is one of the most poignant and touching in Scripture. Simeon had served the Lord throughout his life as a priest. The Holy Spirit was upon him. What finer thing could be said about anyone? The fact that he was looking for the Messiah tells us much about his knowledge of the Scriptures and the leaning of his heart. In this case, the Holy Spirit revealed to him that he would not die until he had seen the Lord’s Messiah. Put yourself in his place. He didn’t know if the Messiah would be a mature man, a boy, or perhaps even a baby. God’s hand was on Simeon and led him to the Temple on a particular day. That particular day was exactly forty days after Jesus had been born. And according to Jewish law, that was the day for the rite of purification and presenting the child at the Temple to redeem the firstborn. At every point along the way, Mary and Joseph were devout Jews following every aspect of the law. Jesus was raised within the law, which would be congruent with His fulfilling the law. Can you imagine Simeon’s joy as he began to realize the identity of the five-week old baby boy in the arms of this young couple? The words he uttered surprised Jesus’ parents. They were prophetic words regarding their newborn. He would be the glory of Israel, revealing God to all nations and at the same time, cause many to reject God’s plan of redeeming and restoring creation. He would cause people to confront the truth in their own hearts in relation to God. Will they bow to God or stand in defiance of the Lordship of Christ in their lives? In a similar way, we are all in Simeon’s position. I’ll frame the question this way, (v.25) Are we righteous and devout and eagerly waiting for the Messiah to (come-return) and rescue (Israel-this fallen world)? We too can die in peace when we have seen your salvation in our own lives, a salvation freely offered to all who would come. —Brandl, Petr. 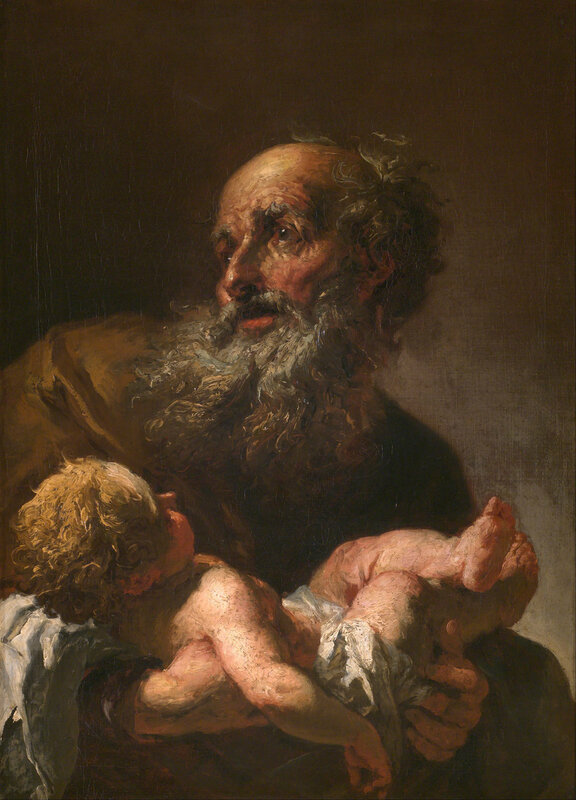 Simeon with Infant Jesus. 1725. Prague National Gallery, Prague. and he is the glory of your people Israel!” Amen.